Rolling 14 regulations into one is no small feat. Figuring out how all those changes will impact your food business on your own? That’s the stuff epic tales of labyrinthine misadventure are made from. Your business doesn’t have that kind of time to spare. That’s why we’ve distilled the need-to-know essentials of the Safe Foods For Canadians Regulation into an easy-to-read, two-part infographic. It translates all that complexity into knowledge your food business can use. 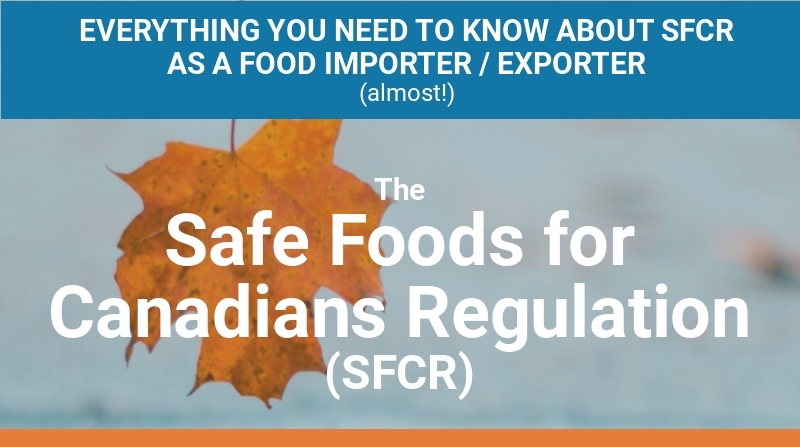 For a high-level, guided tour of the 101-level basics of the Safe Foods for Canadians Regulation (SFCR), check out Part One of our infographic. To start navigating your food import / export business through SFCR’s three pillars of licensing, traceability, and preventive controls—and explore food sector-specific changes—read Part Two. To download a PDF of our all-in-one Everything You Need to Know About SFCR as a Food Importer/Exporter (Almost) infographic, head to the bottom of this page.